'Refined, Elegant, and Sophistocated'.... Our recent projects show interior design trending towards elegance in composition with sophisticated use of color. Clients are remodeling their living space with intent to stay and enjoy the results. Unique personalization and detailed craftsmanship are a significant part of a current conversation revolving around quality installation and timeless design. Here, antiqued silver hardware, hand-carved moldings, millwork accents painted by hand, on-site...these are essential components that bring sophistication to this truly custom design. This iridescent glass mosaic backsplash is a carefully selected design element, adding reflective sheen but not overpowering the fabulous details of this gorgeous kitchen remodel in Paradise Valley, AZ. Builder Dan Madison, of Madison Couturier Custom Homes, Matt from Desert Cove Woodworks and Madison's construction supervisor Mark all make the time to focus on detail and precision in finish work. We enjoyed a thorough pre-installation collaboration with this team, and great communication throughout the project. Tile-to-millwork transition areas were identified and discussed, and focal points requiring exact layout were defined with the client. It was a refreshing team effort that ultimately resulted in the best possible installation. 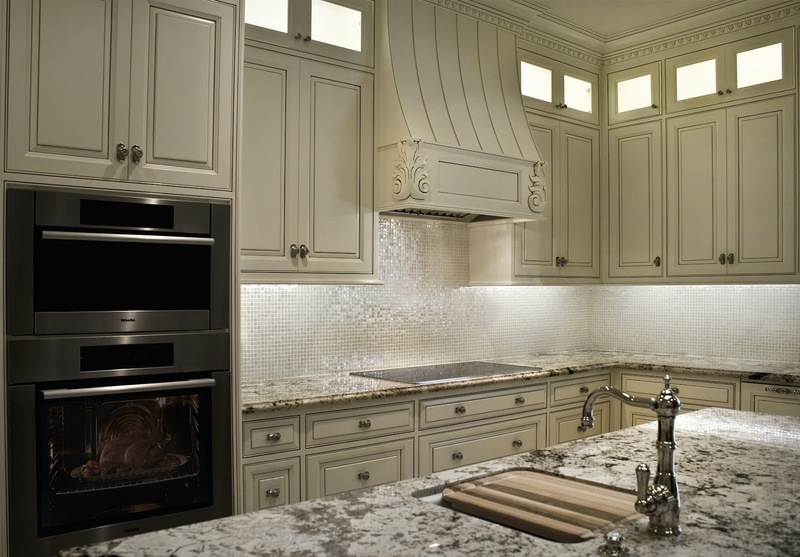 Our installation process commences with protection of beautiful mill work, granite countertops, and limestone floors. Once all is taped and safe, Luke begins by taking measurements for full-tile layout. In this case, the substrate was in excellent condition so relatively minimal preparation (evening out high and low areas in the substrate) was required. 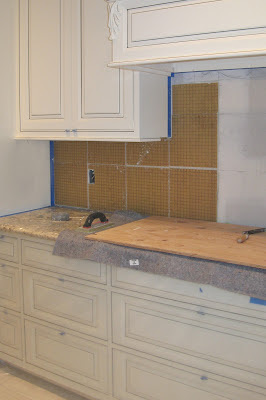 These mosaics are installed using the 'alternate method' - a technique where mosaic sheets are pre-grouted prior to installation. The result is an exceptionally smooth finished tile surface that reflects an even sheen of light. Normally reserved for pools and spas for a smooth surface upon which to sit, this time-intensive method is an additional step we can take where the subtle enhancements it affords benefit the design aesthetic. 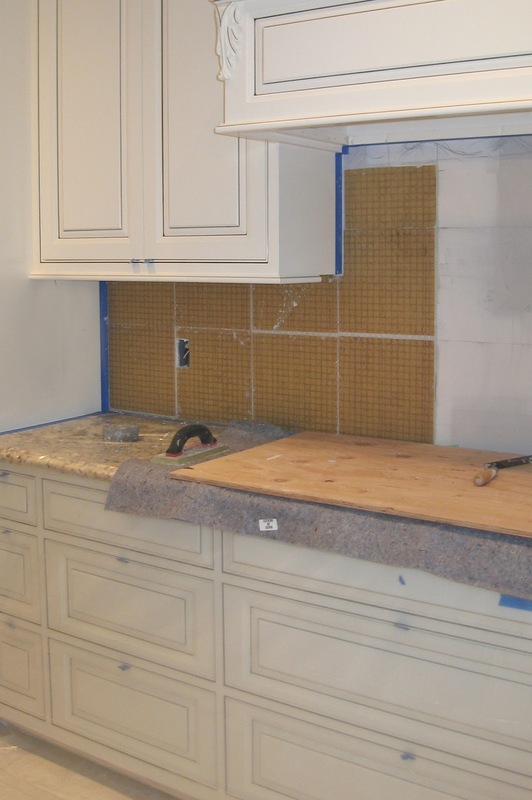 Once back-buttered with grout, mosaic sheets are installed in an even bed of premium bright white thinset, specially developed to bond with glass tile. Even though these glass mosaics are opaque, we use bright white thinset to ensure the brightest, truest color. Luke removes face-mounted paper to reveal a pre-grouted mosaic installation. Minor adjustments are made, eliminating the appearance of sheet lines. After setting materials have a chance to slightly cure, the tile surface is gently wiped clean with a sponge to remove glue residue from grout joints. This also prepares the surface for a final application of grout to fill any open pores resulting from our adjustments. 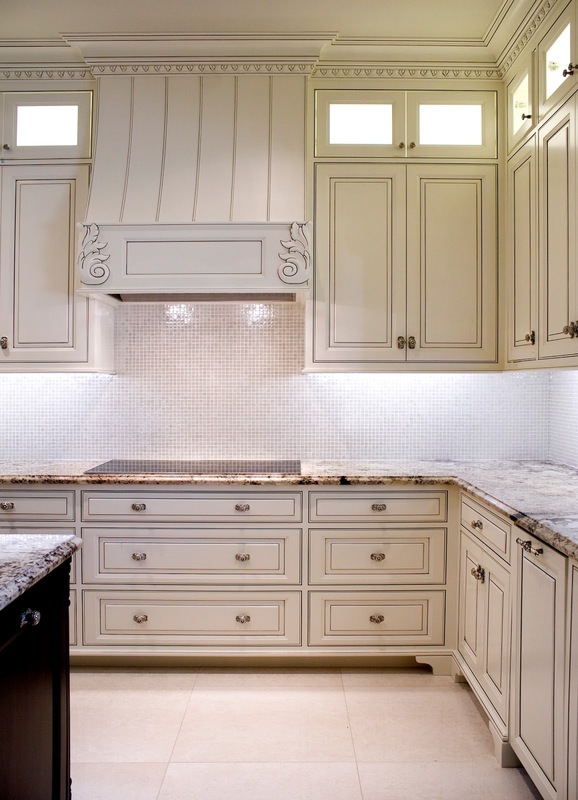 The final result is a neutral backsplash that casts just the right amount of shimmer without overtaking the kitchen design. Beautiful! Designer: Rick Marecek, Marecek Interiors, in close collaboration with the homeowner. Tile: Casa Dolce Casa Glass Tile - Vetro Neutra Glass Mosaic Lux 3/4" X 3/4"